Researchers at the University of North Carolina at Chapel Hill have discovered a molecule that can make brain cells resistant to programmed cell death or apoptosis. This molecule, a tiny strand of nucleotides called microRNA-29 or miR-29, has already been shown to be in short supply in certain neurodegenerative illnesses such as Alzheimer's disease and Huntington's disease. Thus, the discovery could herald a new treatment to prompt brain cells to survive in the wake of neurodegeneration or acute injury like stroke. "There is the real possibility that this molecule could be used to block the cascade of events known as apoptosis that eventually causes brain cells to break down and die," said senior study author Mohanish Deshmukh, PhD, associate professor of cell and developmental biology. The study, published online Jan. 18, 2011, in the journal Genes & Development, is the first to find a mammalian microRNA capable of stopping neuronal apoptosis. Remarkably, a large number of the neurons we are born with end up dying during the normal development of our bodies. 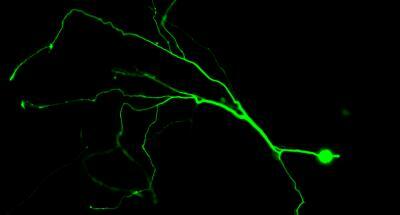 Our nerve cells must span great distances to ultimately innervate our limbs, muscles and vital organs. Because not all nerve cells manage to reach their target tissues, the body overcompensates by sending out twice as many neurons as required. The first ones to reach their target get the prize, a cocktail of factors needed for them to survive, while the ones left behind die off. Once that brutal developmental phase is over, the remaining neurons become impervious to apoptosis and live long term. But exactly what happens to suddenly keep these cells from dying has been a mystery. Deshmukh thought the key might lie in microRNAs, tiny but powerful molecules that silence the activity of as many as two-thirds of all human genes. Though microRNAs have been a hotbed of research in recent years, there have been relatively few studies showing that they play a role in apoptosis. So Deshmukh and his colleagues decided to look at all of the known microRNAs and see if there were any differences in young mouse neurons versus mature mouse neurons. One microRNA jumped out at them, an entity called miR-29, which at that time had never before been implicated in preventing apoptosis. When the researchers injected their new molecule into young neurons, which are able to die if instructed, they found that the cells became resistant to apoptosis, even in the face of multiple death signals. They then decided to pinpoint where exactly this molecule played a role in the series of biochemical events leading to cell death. The researchers looked at a number of steps in apoptosis and found that miR-29 acts at a key point in the initiation of apoptosis by interacting with a group of genes called the BH3-only family. Interestingly, the microRNA appears to interact with not just one but as many as five members of that family, circumventing a redundancy that existed to allow cell death to continue even if one of them had been blocked. "People in the field have been perplexed that when they have knocked-out any one of these members it hasn't had a remarkable effect on apoptosis because there are others that can step in and do the job," said Deshmukh. "The fact that this microRNA can target multiple members of this family is very interesting because it shows how a single molecule can basically in one stroke keep apoptosis from happening. Interestingly, it only targets the members that are important for neuronal apoptosis, so it may be a way of specifically preserving cells in the brain without allowing them to grow out of control (and cause cancer) elsewhere in the body." Deshmukh is currently developing mouse models where miR-29 is either "knocked-out" or overactive and plans to cross them with models of Alzheimer's disease, Parkinson's disease and ALS to see if it can prevent neurodegeneration. He is also actively screening for small molecule compounds that can elevate this microRNA and promote neuronal survival.